Open any pregnancy or baby book, and you’ll find that list: the baby essentials, the things you absolutely cannot live without. While many accessories are easily recognized as frivolous, certain items are truly indispensable: the basic necessities for life with a baby. In Part 1, we questioned the crib. Part 2 bemoaned the bucket. Part 3 scrutinized the stroller. Part 4 ditched the diapers. This week, let’s scrub the tub! I’ll admit off the bat that I hemmed and hawed a bit whether to include this item in this series. Many parents do already understand that’s it’s not really an “essential.” But since it’s another big hunk of plastic that we can live without, frequently included on “the lists,” and since many parents are not fully aware of the alternatives, I decided to include it. Supposedly just the right size and shape to safely contain a slippery, squirmy newborn, baby bathtubs always seem convenient. Until you actually use one. In my experience, at least (I’ll confess that, full of optimism, I used them — briefly — with both of my babies), they are little to no help in keeping baby in a secure position. Baby still slides everywhere. Then when you’re done, it has to be drained, rinsed, dried, and stored somewhere. And suddenly this unusual shape that seemed so well-designed to hold a baby reveals its big, awkward, bulky, and hard-to-fit-anywhere true colours. For a 10-minute bath, it’s an awful lot of work… and then your baby is just going to outgrow it within a few months anyway. Newborn babies are so tiny that any biggish bowl can serve just fine for a bath. Other options would include any bucket you have on hand, and of course your kitchen or bathroom sink. Anything that holds water can be a bathtub. Of course, you should only have a small amount of water in there and always keep your hands on your baby, but hopefully I don’t need to remind you of that. Babies don’t always need “immersion” baths anyway. Unless you have big dried-on poo messes to deal with, infants don’t really get all that dirty, and many are quite alarmed and disturbed at being placed in any tub of water, especially as newborns. A simple sponge bath, with baby lying on a towel or simply in your arms, will suffice just fine until they are big and dirty enough to really need more rigorous bathing. And as for the big dried-on poo messes, if you’ve ditched your diapers, odds are that you won’t be dealing with that particular kind of mess quite as often anyway. Another wonderful option is to just bring your baby into the bathtub with you. How often do new mothers lament that they can’t even get enough time away from caring for their newborn to have a shower? This is the perfect solution. You get a soothing, luxurious bath, skin-to-skin bonding time with your baby, and a clean little tike as part of the bargain. 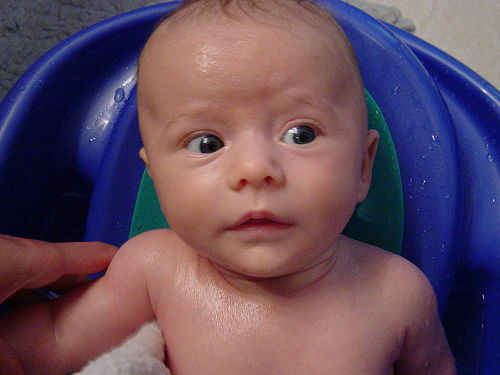 Fussy babies frequently become calm and serene when bathing with mommy. Herbal baths can be beneficial for both mom and baby, helping to heal postpartum wounds as well as the umbilical stump. As always, there are safety precautions to follow when bathing with your baby – primarily, be sure the temperature is not too hot, and that there is either someone available to hand the baby to when you get out, or you have a safe and easy place to put the baby (remembering that you will be wet and holding a wet baby), such as a bouncy seat, before getting out yourself. But when you can manage it, the sheer bliss of the experience is one not to be missed. Oftentimes, parents operate under the mistaken assumption that babies need frequent, even daily baths. But the fact is that they don’t. Our well-intentioned but over-exuberant ministrations of water, soaps, and lotions, strip away the skin’s natural oils leading to dryness and irritation, and frequently expose your baby’s tender skin to harsh (and, arguably, toxic) ingredients such as sodium lauryl sulfate, preservatives, and artificial fragrances. Worse still are those soaps that contain anti-bacterial ingredients such as triclosan. The best treatment for your baby’s skin is generally to leave it alone. If you do use cleaning products once in awhile, make sure sure they are gentle and naturally-based. Babies are not yet sweaty teenagers, and they are not rambunctious children playing in the mud. They need occasional spot-cleaning of spit-up and poo, but that’s about it. As they get older, many babies and toddlers do enjoy baths as part of a relaxing bedtime routine, and that’s fine… but it isn’t strictly necessary from a cleanliness point of view. It may even be in their best interests to let them stay just a little bit dirty. Be sure to check out Part 6: Baby Brain Boosters and Part 7: Baby Food. We just took the babes in the tub or shower with us once their umbilical stump was gone… until then we did sponge baths and at times used the kitchen sink. I remember being gifted with a tub and I thought it was such a pain to haul around, find the right spot, drain it after and then you are left with a drippy messy tub. We did use it at first inside the bathtub, but that seemed pointless so it got donated. I’ve never been one to bath the babies every day either. Their skin needs natural oils to stay healthy, so we would wash up spit up, food spills, etc… but save the whole bath for a couple times a week. While I agree with some of the points in the article, I have been using a plastic bath tub since he was a few months old. It is much easier to keep him in one area with a smaller tub. You also save on water since you are not filling the big tub, but a smaller tub. I agree in only bathing a couple of times a week. Every other day is the schedule I follow. Oh, and that just reminded me… I totally forgot to mention the option of a water sling. I talked about taking baby into the bath, but you can also take your baby into the shower by wearing her in a water sling. Water slings are made of special water-permeable fabrics, sometimes mesh, so your baby stays secure while you have your hands free to wash with, you both get nice and wet, and it dries quickly and easily. John, I never said to put tiny baby in the big bath, unless you’re going in there too. I do say that you can use ANY appropriately-sized container, or your sink, so you don’t need to buy an extra, specialized, big plastic baby tub. I totally agree with you about the water usage. With our first daughter when I mentioned about bathing my husband told me his brother used to just take my husband’s nephew in the shower. We tried it and it works great and now that she is a toddler it is easy to get her into the shower with me when her little hands, knees and feet are dirty. With our second daughter we have taken to using the kitchen sink and that works wonderfully as well. I feel that I have better control than I would with a baby bath tub where I have to hunch over on the floor bathing her (we don’t have really much counter space to put a baby tub on because we have a small house). Showering or bathing with your baby is a wonderfully relaxing experience. I don’t know, I think it really depends on the person. We actually have that exact tub pictured above(!) 🙂 and it works great for us, even 14 months in. I tried bathing with my daughter twice but she is just way too hyper and loves water too much (she’d drink the tub’s worth if I let her. . ) and without getting into too much detail, it just wasn’t good. The kitchen sink could work well, but then I’d really have to scrub it out well before putting her in there as kitchen sinks tend to carry a tonne of bacteria. . ..Oh, and we store it in the regular bath tub. When my husband and I want to take a shower or a bath, we just put the baby bath tub on the bathroom floor. I got a baby tub as a shower gift and used it one time. For one, it’s too big for my sink and is constantly moving and slipping from where it’s suppose to sit. I found myself trying to hold him and the tub at the same time. It was a nightmare. For his second bath, I cleaned out my second, sprayed it good with Lysol and let it dry. Then I folded a kitchen towel in the bottom and filled it with about an inch and a half of water. I found this much easier and he enjoyed being emersed in the water while on his back. I then use my sink sprayer to rinse him off and he loves it. I don’t know what I’m going to do once he outgrows my sink!! I also only bathe him once a week in order to maintain his natural oils. Anymore than that and his skin dry’s out really bad. He’s only 2 months old so he doesn’t get overly dirty anyways. As he becomes more mobile, he will get more baths. I love my baby bathtub. To me it is MUCH easier than trying to scrub the sink that my 3 year old ALWAYS throws something in right before bathtime for my daughter. And she does NOT like being dirty. She will throw a fit all day if she has missed her every other day bath the night before. Thank you for this series! I never used most of the items on this list, but it’s giving me permission to ditch two items I always hated: the bucket seat, and the baby bathtub. Geez, I hate that thing! I even avoided bath time because it was so hard to use.